“I first heard of Val from a deeply attuned friend who was having amazing breakthrough experiences in getting healing for her cat and also herself. I was intrigued and set up my own appointment. I have two cats, but I really wanted help for my 17-year old cat, Simba, the love of my life, who was experiencing a number of serious issues – hyperthyroidism, kidney problems, heart problems, digestive problems, mass in pancreas, teeth problems, etc. “Someone told me that I could communicate with animals. I didn’t believe this was really possible for me but out of curiosity I thought, if this is true, I should pursue it further. I am an animal artist and thought this could be quite valuable to be able to communicate with my subjects as well as with my own dogs. “I sought out Val’s course as I have had some clients and friends seeking assistance with their pets and realized, to help those people further, I needed to know more about animal communication. “Spending time talking to Val about my dog, Stella, turned out to be very enlightening and more productive than the many trips to the vet have ever been. “Val’s Quantum Leap sessions are amazing. In addition to animal communication and BodyTalk healing sessions, I decided to go for Val’s Quantum Leap sessions. I realized there was something buried within me that was causing my heart to fail (I’ve had 10 heart surgeries in the last 15 years), was making my relationships with my husband and son problematic, and was keeping me stuck in a job I’d come to hate. I wanted her help releasing old fears and energy that I knew was trapped inside but could not locate or clear with any of the other work I’d done. 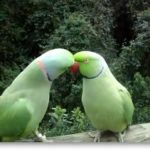 “I have used Animal Communicators regularly over the years. 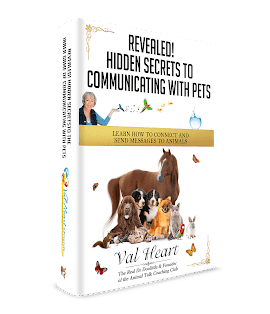 With Val you are getting more than an Animal Communicator. You are also getting an Animal/Medical Intuitive. 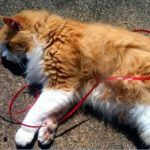 “I set up a session with Val when my cat Abraham (Abie) deteriorated suddenly from what I assumed was the arthritis he had been diagnosed with a year earlier. “My senior dog companion Casey was experiencing serious health issues. My family members, friends and our vet were pressuring me to put him down… but I felt that it wasn’t Casey’s time to go yet. Before I made the decision to end Casey’s life, I turned to Val for help. “I called Val when I was feeling I should give up on my scared, aggressive, rescued Haflinger horse, Gabe. After two years, he still nipped and bullied people and his four herd members. “When I first contacted you, I was so worried about my furrkids, 1 senior dog Noah and 2 kitties. They all have health problems and I didn’t know how to best help them. “I started my journey with you a year ago because of the loss of my spirit dog, Kalik. I was devastated and my grief was incapacitating. I couldn’t imagine how I would go on. “During the past few months I have been amazed – truly astounded – to learn how effective acupressure (AP) can be for my wonderful agility dog, Deli. “Our dogs were attacking our baby ducks and no amount of talking, telecommunicating, discipline, or reprimand was solving the problem. I have had a lifetime of dealing with animals, and many called me ‘Dr. O-Little’ (riffing off my last name) or a pet shrink, but in fact I had a lot to learn. “I cannot even begin to enumerate the ways you have helped, guided and blessed me and my fur-babies over the last 14 years!! THANK YOU is an understatement. “Before my session with Val I was still filled with immeasurable grief experienced with the loss of my forever dog, Kalik. Even though it had been six months since his transition into spirit, I had trouble connecting with him and still was feeling empty and without purpose not having him beside me in physical form. I had lost all interest in moving forward in life, as he was my reason for being. “I just wanted to take a moment to sincerely Thank You for your wonderful home study course. I have completed it, and it has been extremely helpful. Thank you again, and I wish you all the best!” – Patrice B. “Your work with Slim has been fantastic. After a cross-country move I could tell she just wasn’t happy. I gave you a try because nothing else was helping. You were amazing and now she is so much happier, back to her normal self. And you helped address her ongoing lameness issues. I look forward to our talks like I would a dinner party or special holiday! “You started me on a new path and a week later my formerly fractious pack is sitting here around me calmly. No one is fighting, they are not growling at each other constantly, they do not bark all the time anymore, and they are happy to listen to and obey me. It seems like a miracle but it is not, just the results of listening to someone who really knows what she is talking about and can communicate that effectively to others. Communicating with understanding really is the key. 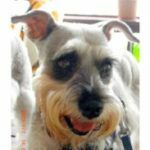 “We started working with Val for our minature schnauzer, Heidi. Heidi had severe anxiety during thunderstorms and more importantly serious biting problems. From a young age she snapped at strangers and occasionally us, and we were very worried about her attacking children. It was getting to the point of questioning whether we still wanted to keep her. This was very distressing, because we are very attached to her. “Words cannot express how eternally grateful we are for your assistance during the transition of our 16 year old cat, Punkin. My only regret is that I did not contact you sooner!